← OS ep 31 – Paul Joseph Rovelli – Alchemy, Community Building, and The Great White Brotherhood. On this episode of the show Sam and I discuss his book, Tantric Thelema. We also discuss lineage, the Open Source order of the Golden Dawn, of which he is the founder and former head, and much more. This entry was posted in podcast and tagged Buddhism, Golden Dawn, Sam Webster, Tantra, Thelema. Bookmark the permalink. 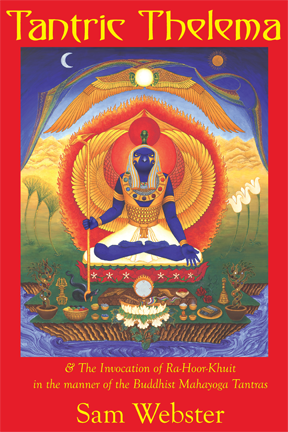 The Open Source Order of the Golden Dawn, with Thelemic and Buddhist elements mixed in, sounds most intriguing also. Ditto with the RHK empowerments Sam is doing. Wish I lived closer to California myself so I could participate in some of this work! Thanks again for a most interesting and thought-provoking interview. Glad you are picking up a copy of the book! I’ve forwarded your comment to Sam. I think synthesizing new blends is going to be huge going forward. Not only to adjust for personal tastes and interests, but to align us with new issues and currents we are living with. I also wish I was closer to Cali for this, but why not start your own GD group in your area? I’m sure the order’s documents are open source! =) I’ve certainly been considering it. Hi Colin, Check out the PEX experiment, jambase, playa del fuego, and maybe some boston burn type events, join the boston burner + pagan email lists to find out about them. Also there are some pagan-ish festivals / conferences in western mass coming up. Keep your ear to the ground, you may also check out witchvox (a website) to network. I’m all over the place, and facilitating breathwork in Belmont coming up. http://www.bostonholotropic.com Also a short workshop on Saturday at Eternal Balance in Beverly MA. Greg of OOP also does lectures / classes there. Very nice show and interesting discussion. BTW, I tried the email address podcast@occultsentinel.com and the msg. bounced back as undeliverable. Any suggestions? That email issue should be fixed. Thanks for the comment Roland.